The Crimson tallied 2 goals in the final period to seal its spot in the Beanpot Championship next Tuesday. 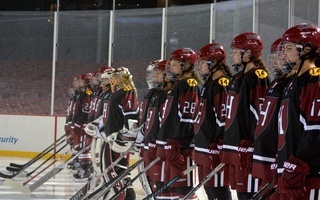 Backstopped by a heroic goaltending effort, Harvard women’s hockey upset the nation’s seventh-ranked team to advance to its first Beanpot Championship since 2015. Its win over Boston College (19-10-0, 16-7-0 Hockey East) Tuesday night books the Crimson (8-11-3, 6-8-2 ECAC) a championship duel with the Boston University Terriers, who defeated Northeastern in the first semifinal of the day. 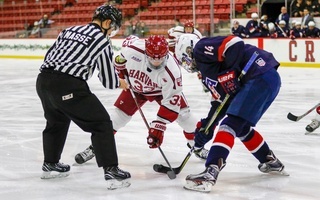 Despite putting only 12 shots on goal by the close of the second period — compared to the Eagles’ 38 — Harvard entered the final stanza clinging to a 2-1 lead. Spectators were just settling into their seats as the puck fell to the ice for the third period opening faceoff. Co-captain and forward Lexie Laing won the draw, and freshman defender Kyra Willoughby quickly secured possession. Advancing the puck up the boards, Willoughby saw junior forward Kat Hughes, who pushed the puck to a streaking Laing. 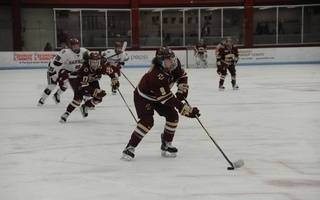 Maintaining an edge on the BC defender, Laing fired along the ice as she neared the faceoff dot. The puck slid under Eagle freshman goalie Maddy McArthur and—just nine seconds into the period—the Crimson had widened its lead to a 3-1 advantage. 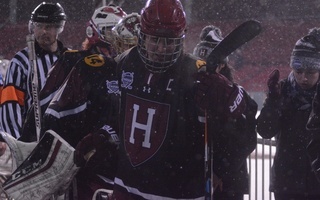 Although Harvard found its stride in the third, striking instantly before later adding another goal to increase its lead to the 4-1 final tally, getting there was no walk in the park. A 53-shot onslaught by BC demanded impeccable defense from the Crimson. The Eagles struck early and often, putting 19 shots on goal in the opening period on the way to their jaw-dropping total. Harvard’s defense was more than up to the challenge. Freshman goalie Lindsay Reed established control in the nets, locating shots through heavy traffic, beating BC passes with quick lateral movements, and stifling second-chance opportunities with tight rebound control. Reed’s career high 52 saves on the night marked the first 50-plus-save performance by a Harvard keeper since 2016. Her most clutch play of the game came during a BC five-on-four advantage in the second period. Riding a power play opportunity from a tripping minor by Laing, the Eagles funneled the puck across ice to set up a shot on a largely open net. Reed sprang into action, executing a sprawling kick save. The Crimson killed the penalty moments later and went on to score barely a minute after Reed’s denial. With Reed as the squad’s backbone for the night, Harvard was able to muster the effort to pull off the upset of a top-ten opponent. Embodying the “nothing to lose” attitude, the Crimson played at a frenetic pace in the first minutes of the game, and the Eagles matched the intensity. Constant end-to-end play carried on for more than seven minutes, interrupted only once by the referees’ whistle. With activity settling down, Boston College took to the offensive and created the majority of the period’s scoring opportunities. Despite the Eagles’ offensive efforts, the Crimson defense proved impenetrable, bolstered by Reed coming up with several saves and Willoughby deflecting two dangerous centering pass attempts away from BC. Eventually, the advantage in shots paid off for the Eagles. With 41 seconds to go in the first, sophomore forward Daryl Watts rounded the back of the net before curling up the half boards to set up a high-slot one-timer from BC captain and forward Makenna Newkirk. As Newkirk powered the shot towards the goal, the Harvard defense managed to tip the attempt. The deflection, however, was not enough, redirecting the puck through Reed and into the back of the net. Despite the Crimson’s intermission regroup, as the second period began, the offensive side of the ice saw BC continuing to heavily outshoot Harvard. The Eagles held a 26-8 lead in shots on goal as the second-period clock ticked below the 12:00 mark. Then, sophomore forward Becca Gilmore cleared Crimson territory, carrying the puck through the neutral zone before relaying to sophomore forward Brooke Jovanovich. Collecting the puck at the blue line, Jovanovich faced a one-on-one. Looking to create space, she cut to the faceoff dot and fired along the ice. Squeaking through the BC goalie’s 5-hole, the puck rattled inside the post to knot the game at one. Less than six minutes later, Harvard continued its highly efficient offense as sophomore forward Kate Glover rushed the puck up the ice. With Eagle defensive attention glued on Glover as she crossed the blue, freshman forward Dominique Petrie found a pocket in the slot. Receiving a pass from Glover, Petrie netted a top-corner snipe to hand the Crimson a 2-1 lead, adding another set of points to the Jovanovich-Petrie-Gilmore line. By the end of the night, the triumvirate would combine for five assists and three goals for an eight-point outing. With the Jovanovich-Petrie-Gilmore line clicking at high volume and Laing striking just nine seconds into the last act, BC had to alter its play. Down 3-1, the Eagles shifted their focus from defense to offense, exposing themselves to the Harvard counterattack. The Crimson seized on the gaps left by BC’s new offensive focus. With five minutes remaining, a Gilmore drive down the ice brought the puck past the blue line. Petrie crashed the net, and Jovanovich was there to score her second of the night off a far-pad rebound, booking Harvard’s ticket to the championship game. 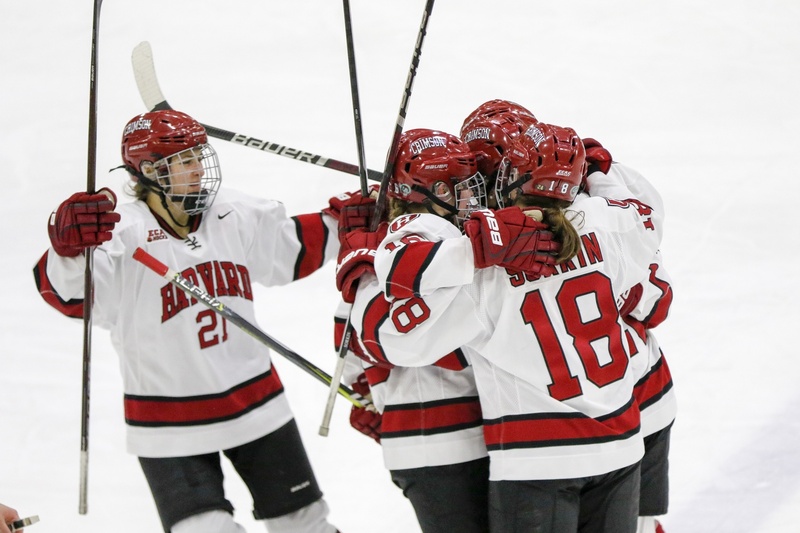 The Crimson returns to ECAC play this weekend before vying for the Beanpot, with away games on Friday at Union College and Saturday at Rensselaer. Still needing to make up ground in the conference to secure a favorable playoff position, this weekend’s slate of games supersede Beanpot preparation for the time being. Next Tuesday, an 8 p.m. puck drop at the Bright-Landry Hockey Center marks the start of Harvard’s Beanpot Championship matchup against No. 8/8 Boston University. By then, the Crimson will have played six games in 12 days.